OneGigabit, a small start-up launched by computer networking and telecommunications specialist Eric Kuhnke, says that for $45 to $65 a month, he will be offering speeds comparable to those offered by Google Fiber, and also with no bandwidth caps. Google's blazing-fast internet service caused a buzz in the U.S. when it first launched last summer in Kansas City, Kan., and Kansas City, Mo., for a modest $70 a month. A recent report from internet metrics company Ookla showed the average monthly Canadian internet bill is $54 for an average download speed of just 16.6 megabits per second. A gigabit per second is the equivalent of 1000 megabits per second. - You can stream at least five high-definition videos at the same time (allowing multiple people to watch different things in different rooms of a house or download). - You can download an entire 14-gigabyte digital movie in less than two minutes. - You can transfer data over the internet faster than you can write it to a thumb drive. 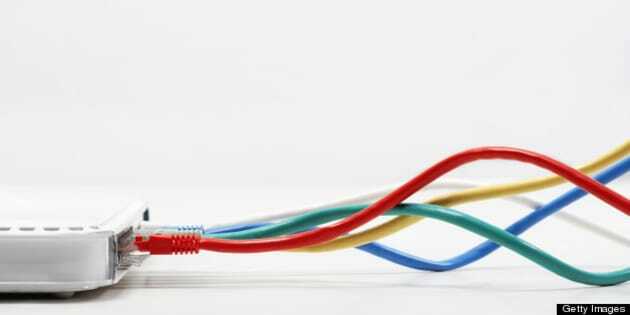 But ultra-fast internet speeds are typically only possible if the "last mile" — the wiring that connects a building to the rest of a telecommunications network — is made of fibre optic cable. That is only the case if the traditional copper wiring has been recently upgraded to fibre technology. Because of that, the availability of fibre internet is limited in Canada, mainly to certain buildings and neighbourhoods in urban centres, and it isn't cheap. Advertised fibre internet packages from major internet providers such as Bell, Rogers and Shaw top out at 175 to 250 megabits per second and cost $115 to $226 a month. In Vancouver, Shaw offers one gigabit per second internet service in small pockets and 250 megabit service in other areas for $115 per month. Novus, a Vancouver-based internet provider launched by the Concord Pacific Real Estate Group, offers 300 megabit per second service for $113 a month in certain buildings in B.C. 's lower mainland, mostly highrises, including many built by Concord Pacific, which put fibre optic cable in them when they were constructed. However, Kuhnke estimates that 98 per cent of Vancouver buildings don't have fibre, and most buildings that do are large office towers. OneGigabit's plan is to negotiate with real estate owners, managers and developers and hook up entire small- and medium-sized apartment, condominium and office buildings that don't currently have a fibre connection. "To be frank, it's uneconomical to serve a single client, with the construction costs that are involved to run fibre to one particular tenant to the building," Kuhnke explained in a phone interview. That's why he is targeting as clients the owners and managers of both existing buildings and those that are about to be built — in fact, he said, costs are significantly reduced if plans to run fibre to the building are made during pre-construction planning. Building owners and OneGigabit would share the cost of running the fibre to the building, which is cheap if it's strung on telephone poles and more expensive if it is run underground using a technique called microtrenching. The fibre inside the building, connecting directly to each unit, would be paid for and owned by the building itself. In cases where the building's location makes fibre installation problematic, Kuhnke has a backup strategy — he is installing rooftop microwave transmitters similar to those used by mobile phone carriers to beam the data from building to building. According to OneGigabit, the technology can transmit data at up to two gigabits per second over distances of up to eight kilometres. OneGigabit would cover the cost of the networking equipment, and building owners would commit to a monthly fee per unit for internet service for a fixed length of time, such as three years, with the option to continue the service after the contract is up. That fee, which would vary between $45 and $65 per month depending on the cost of connecting that particular building, could be passed on to residents in their maintenance fees. Residents would have the option of subscribing to competing services if they wish, but the building would still have to pay the contracted fee to OneGigabit for its service. Kuhnke, whose start-up is backed by two private investors, said advances in technology are what has made his business model viable. "We could not have done this two years ago or even 18 months ago," he said. "The radio equipment was half the speed and double the cost." The cost of fibre has also fallen dramatically in recent years, thanks to the economies of scale provided by its large-scale installation in Taiwan and China, said Kuhnke, who spent many years working in Asia as a network and telecom contractor. "Those cities are so far ahead of us." Kuhnke said that, following OneGigabit's launch last week, the company quickly signed up a condo developer who wants to get fibre in before the concrete for the foundation is poured as well as another real estate company that is renovating a building in Vancouver's Gastown neighbourhood in order to attract tenants at a higher lease rate. He added that if OneGigabit does well in Vancouver, he would like to expand it to other urban centres in Canada. Catherine Middleton, a professor at Ryerson University who holds a Canada Research Chair in Communication Technologies, told CBCNews.ca in an email that she expects Kuhnke's business model to be successful, since it allows for financing of the network and provides a high-quality service to residents. Len Waverman, Dean of the DeGroote School of Business at McMaster University in Hamilton, and a researcher whose specialties include the telecommunications business, said he thinks the microwave technology that Kuhnke is taking advantage of is "very exciting." "There's no reason why it can't work," he said, although he cautioned that microwave transmission is less reliable than fibre, especially in bad weather. Waverman said he could see a demand for gigabit speeds among smaller businesses, but he questioned whether many people would want it in their homes. "I just don't see what a gig to the home would do," he said. "It's nice to say you have it available, but if you're using it just to download lots of movies, I don't see what the business proposition behind that [would be]." Middleton said affordability is the key to consumer demand. She noted that a 2012 CRTC report showed 75 per cent of Canadian households had access to download speeds of 50 megabits per second or higher in 2011, but at that time only 0.3 per cent of households subscribed to those speeds. She added, "If the price were comparable to lower speed services, as it is in Kansas City [with Google Fiber], I expect that demand would be high."